Rank Ranger's SEO Dashboard lets search marketers customize their inbound marketing results all in one report with more than 40 metrics, SERP snapshots, colorful widgets, multi-metric graphs and custom filters. From adding your own custom report title to selecting columns to display, rank data filters, single domain vs. rank competition view, and topping it off with an SEO performance widget, your SEO Dashboard is fully customizable, limited only by your imagination and creativity. Increase the footprint of your website's search results by optimizing for SERP features. 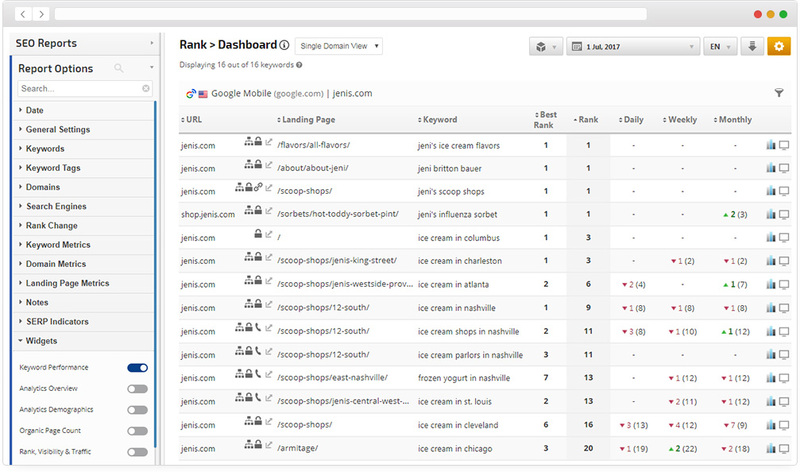 Our SEO Dashboard displays your SERP feature scorings daily so that you can monitor the success of your efforts. Apply filters to zero in on results that have a specific set of SERP features that interest you. Take advantage of the dashboard's SERP Snapshot feature which displays the Top 10 organic results, all the organic SERP features (AMP, Ratings, Sitelinks, Phone, etc), and page-level SERP features such as Ads, Related Search phrases, Knowledge Panels and Local Panel. Examine a keyword's rank over time versus the overall organic visibility of the website. Does the keyword's fluctuation correlate with the overall website or is it on its own trajectory? Take a quick ultrasound of your landing pages to see if you have "twins", i.e. two landing pages competing for the same keyword. If that’s the case, take quick action to remedy the issue. Get a complete graphic snapshot of what’s happening on the SERP for any keyword and gain access to inside intelligence by seeing what your competitors are doing with their metadata. Choose from a powerful set of filters and sorting features. Focus on subsets of your rank data to facilitate analysis or customize reports. Take a look at all your keywords that rank on page 2, or maybe just those in the top 10, or the ones with negative change. All that, and much more, is possible using filters. The SEO Dashboard is both feature-packed and flexible. Choose from a large array of metrics. Decide which metrics to display at any given time. Get some perspective on your rank performance by switching the dashboard to competitive view. Compare how your website is ranking versus the competition across the entire range of metrics and SERP features to get the full competitive picture.